Need to get fence repaired. We've had some wind damage overnight to a cedar fence in our back yard. The main sections between the posts look fine but a few of the 4x4 posts have given way. Any chance you might be able to stop by and provide a quote? We had you out in 2017 to fix a section of fence lost to a fallen tree. Have nosy neighbors? Perhaps you’re concerned about pets getting loose? Maybe you just want to boost your home’s curb appeal? There’s no shortage of reasons you might want a new fence for your home. Want to get started installing a new fence or replacing your old one? Give us a call today and schedule your free estimate! While fences are a valuable asset for any property, they are especially valuable for commercial properties. If you own a commercial property then an attractive fence can not just improve your security, but also help to make a positive first impression on potential customers and clients. All of our solutions will be customized to your particular needs and vision. You can also count on us to do the work quickly and coordinate with you to minimize the impact on your employees, tenants, or clients. While the security a fence provides is wonderful, you need to make sure that entrance is still easy for you and your family, customers, or clients. Automatic gate operators will let you do just that. We can install a reliable access control system that will let you keep out unwanted visitors while causing minimal inconvenience to the people you want to enter. Interested in a new residential or commercial fence? Have an old fence in need of replacement or an access control system? 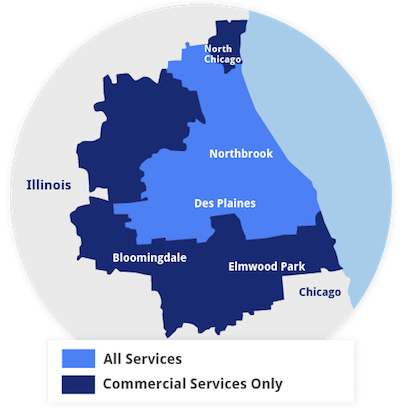 Contact us today and schedule your free estimate for any of our services in Deerfield, IL!